“Time to wake up,” I say and gently shake my 10 year-old. I never like waking him. He sleeps so soundly, like a baby bear in winter, albeit one with a severe balding problem. I used to just think I lucked out with an easy baby, but now I know the truth. Tyler is a dreamer. Not the day-dreaming type, although at times, he does seem to exist in his own world. No, Tyler is a night dreamer, prone to vivid, dramatic escapades. Often, he’ll wake with such a tale to tell, you’d think he’d just been to the movies. There might be battles of revolutionary proportions. There might be flying or swimming with sharks. He might save the world or just his own skin. “Come on, baby.” I coo, but Tyler barely moves a muscle. I give him the five minute warning and head down to the kitchen. Today is his graduation from elementary school. Come September, my sweet boy will be in middle school, walking with his friends instead of taking the bus, carrying a cell phone, as well as a more little swagger and snark. While it doesn’t seem like yesterday when I first put him on the bus for Kindergarten, it doesn’t seem like six years ago either. He stepped into that school a baby and now he’s a boy. He’ll step into middle school a boy, and he’ll step out a teenager. He’s on his way to growing up. “Who wants pancakes?” I ask my two younger boys, already at the table. “I want cereal.” Tyler announces, finally making an appearance. 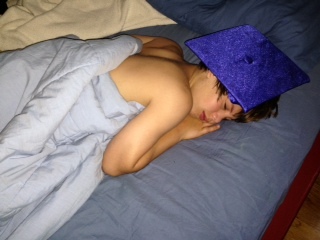 “Good graduation morning,” I say brightly and he comes directly to me for a long, still sleepy hug. “I had a great dream.” He says, eyes lit with excitement. “Tell me,” I encourage, and he shares a story where he is the hero of a battle, flying over fields, dodging attacks, outsmarting legions of men. I love his dreams, they’re rich and dazzling, and he’s always the star. I can’t remember the last dream I had with any sort of intensity. I don’t even think I dream much anymore. At the very least, I don’t really remember any of them. I wonder if it’s me. If my brain is too cluttered with every day to dream? If, like the follicles of a womb, dreams are numbered and soon I’ll have no dreams left? Or, maybe dreams really are visions of the young. I used to fly in my dreams. Even 30 years later, the lightness and freedom of those dreams linger. I can still almost feel them. But it’s been a long time. I hope he never loses his ability to fly, to be the hero, the star of his own exciting adventure. His life is unmarked territory, the path wide open. There are real battles ahead, loves to pursue and monsters to conquer. I hope he keeps dreaming, and I hope he lives his dreams. Except maybe the ones where he’s fighting sharks and stuff. Posted in Every Day Scoops and tagged big dreams, dream on, dreaming, graduation dreams, life dreams, live your dreams, people say i'm a dreamer, vivid dreams. Bookmark the permalink. Sweet Tyler. His dreams sound amazing. This one made me teary-eyed. TIme keeps on slipping, slipping, slipping…..
i know!!! it seems like minutes ago!!! my youngest starts Kindergarten in september! Love that picture! I don’t usually remember my dreams either, but once a month or so I’ll have a doozy of a dream that I don’t ever forget. Strange, the way minds work. Congratulations to the graduate! Wonderful. I love it that he can dream and so vividly at that. You might have a screen writer in the makings there! Congrats to Tyler – and I know how you feel, I too have one going into middle school – where did the time go? time… it keeps on slipping slipping… crazy! What a gift that he can remember his dreams in such detail. Sweet story. It’s hard to watch them grow up, isn’t it? I hope he keeps dreaming those dreams, too. Congrats on having a middle schooler!! It sounds like he has a great imagination, and he is probably creative. thank you. he does have a great imagination! always has. Does he have any interest in writing down his dreams? he has tried to a bit, and i’ve encouraged, but not with any consistency. you’re right, it’s a great idea, i’m going to get him a spiral notebook to keep by his bed. This is a very sweet ode to your son 🙂 Best wishes to him as he transitions to middle school! Dreams have been a big topic in our house too. I love, love, love those flying dreams – nothing better (even my Olympic medal dream doesn’t compare! ;-)) Congrats to your sweet boy! the olympic one is pretty good. but yeah, flying is the best. just back from fifth grade dance. Sooooo cute!! I love, love, love this post! The writing is beautiful. Your son sounds like the type of kid I enjoy being around. It also seems like he’ll become a writer someday. Great post! I love this: “…if, like the follicles of a womb, dreams are numbered and soon I’ll have no dreams left? Or, maybe dreams really are visions of the young.” I’ve often wondered why it seems we have a harder time holding on to our dreams as adults. Maybe when you’re a child it’s easier to tap into your hero’s adventure? I often remember my dreams. You have so many bittersweet posts! i know! what’s wrong with me!! i am such a sap!!! Ha! Love the picture. Something I would totally do to my kids. My baby is starting kindergarten in the fall, and it just seems like they are growing up so fast! Congrats to your almost middle schooler. What a wonderful post, and a wonderful ability. My dreams aren’t nearly so vivid, either, but they sure used to be…although I’m more prone to nightmares than anything else. me too! it’s such a gift!